Activist Gavin McInnes takes part in an alt right protest of Muslim Activist Linda Sarsour on May 25, 2017 in New York City. Facebook on Tuesday began taking down pages affiliated with the "Proud Boys," a far-right organization whose members were allegedly involved in a violent fight in New York this month, NBC News reported. Pages on Facebook and Instagram that previously belonged to the group disappeared and instead showed messages saying they were not available. The social networking company confirmed the move and cited its policies against hate organizations and figures. Several members of the Proud Boys were arrested this month, in the days after police said the group was involved in a fight with masked protesters belonging to the anti-fascist coalition Antifa. 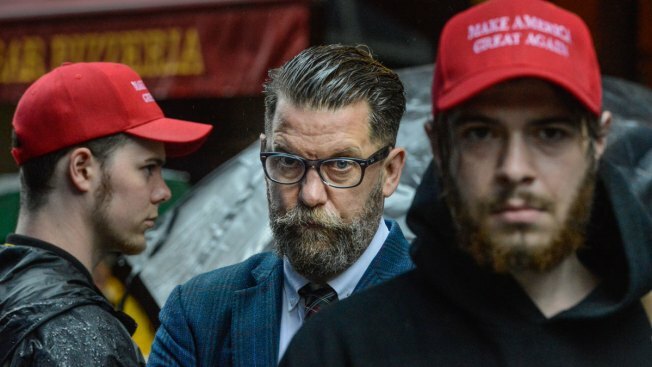 The fight occurred after Proud Boys founder Gavin McInnes gave a speech on Manhattan’s Upper East Side.